Let’s start with a confession. I had never heard of Jankowski’s Bunting before last week. But once out in the open spaces of Miyun Reservoir, it occupied my every thought. Backtrack a couple of days and I was heading out to Beijing. 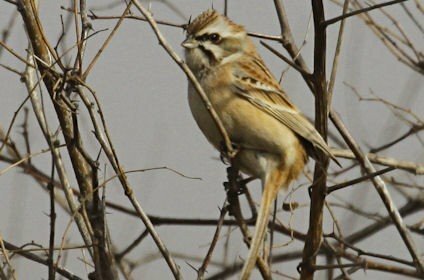 Terry Townsend’s website, www.birdingbeijing.com is the prime resource for anyone planning a trip to the city with intent to bird and Terry offers guiding services. I had a spare day which coincided with the weekend. Any open areas close to the city would be thronged, so I contacted Terry and asked if I could join him on a trip that he had booked for two other birders out to Miyun Reservoir. They were targeting the Jankowski’s Bunting, but would obviously look at other birds along the way. I had seen the bunting (also known as Rufous-backed Bunting) reported, very excitedly, on Terry’s website, but did not fully appreciate the significance until Terry picked me up early on Saturday morning. Russell and Amy had travelled five and a half hours by train from Shanghai to join Terry in the hope of finding the bunting and explained that it was a very rare bird. “….rarer than the Spoonbilled Sandpiper”. Well that caught my attention! Out on the grasslands of the reservoir, Pallas’s Bunting, Meadow Bunting, Japanese Reed Bunting and Siberian Accentor all sought to distract us from the prize, but eventually, as we were beginning to worry that we might not find one, Terry called “Jankowski’s!” as three birds flushed up into a bush just ahead of us. And there they were; two males and a female. A fourth bird showed the distinctive belly spot of the adult male, but eluded auto focus. Well that sounded easy didn’t it. I suppose it was, but only because Terry has been following them for a few weeks and they have remained faithful to a small area. So finding them was merely a case of keeping the faith, the fact that they are there is the big surprise. 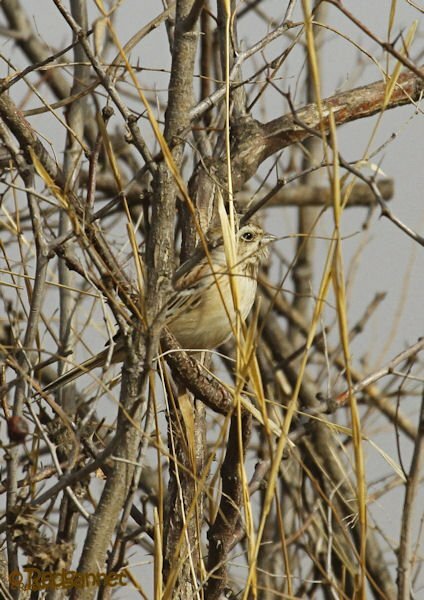 The Buntings’ current accepted range is further north but a young Chinese birder had spotted one at the reservoir just outside Beijing and had contacted Terry to confirm it. 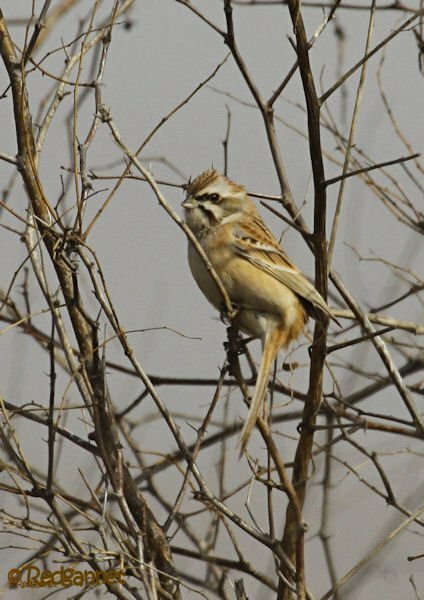 The birds usually remote habitat makes it difficult to gain a full picture of range and population status, but it appears to have suffered a drastic decline in its former breeding areas as grassland is overtaken by agriculture. 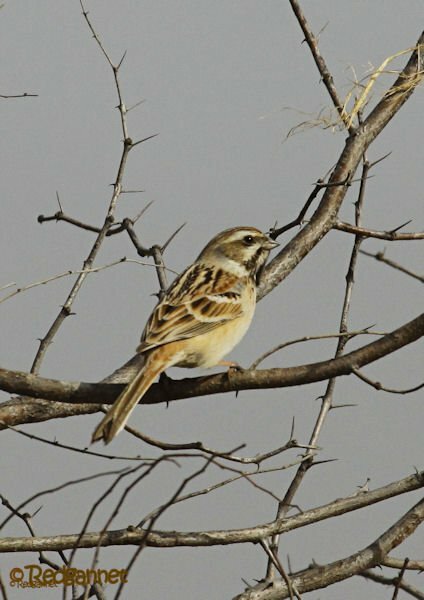 The Birdlife International factsheet makes depressing reading and suggests that the IUCN Red list entry for the Jankowski’s Bunting could be uplisted from endangered to critically endangered. An article in Birding Asia from 2010 put forward that the bunting could be the next east Asia species to go extinct. Terry has been one of the loudest and most dedicated activists working to study and conserve the bunting and birdingbeijing is a Birdlife International species champion for the bird, so it was an ironic twist that the bird was discovered on his patch while he was out of the country at an Oriental Bird Club meeting in the UK. So here I am now, having not even heard of the bird last week, seeking your support to help save it. There is a campaign, set up by Birdlife International and backed by Sir David Attenborough, which accepts donations to fund conservation work aimed at preserving the bunting. Thank you for your generosity. Terry’s website is impressive, and moved Beijing onto my list of cities I’d like to visit. Cool lookin bird too. Thank you, Duncan. You’re very welcome to visit Beijing and I’d be delighted to show you around.. With 475+ species recorded in the capital, there is great birding at any time of year!